Undergraduate biology textbooks do little to teach students how science can contribute to successful careers in industry or improved business practices at a time when some fear that science is under attack by corporate interests. A new study from the Center for Integration of Science and Industry at Bentley University shows that textbooks for first-year, undergraduate biology fail to provide context for applications of science in business and instead perpetuate a negative stereotype of industry and its relationship with science. This may impede the goals of science education by impairing both student engagement in the science curriculum and their ability to apply science in the workforce. The article, entitled “Representation of industry in introductory biology textbooks; a missed opportunity to advance STEM learning” appears in the journal CBE–Life Sciences Education. The research used text analysis to identify passages mentioning business or industry in textbooks used by >2 million first year biology students annually in the US. The analysis found few passages describing how biology could be employed in business careers and few examples of industrial applications of scientific concepts to support context-based learning. In addition, the research found that most of the mentions of business or industry were associated with negative connotations and that there was a disproportionate number of descriptions of irregular or fraudulent corporate actions. While the large majority of students who enroll in undergraduate biology will ultimately work in business occupations, these curricular materials provide little foundation for applying science in these careers. The article discusses the results in the context of research showing that business decisions inevitably begin with fast, intuitive thinking, which can introduce biases into critical analysis. 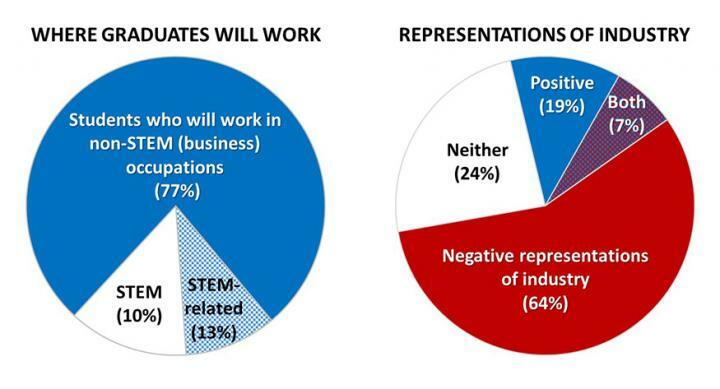 Repetition of negative stereotypes of business in science textbooks, coupled with the prevalence of such stereotypes in the popular media, encourages students to see science as being essentially at odds with business practice. A more effective strategy would be to provide constructive examples of how science can inform effective business practice to encourage reflexive use of science in business careers. The study’s coauthors include Dr. Helen Meldrum, Eric Ndung’u and Dr. Fred Ledley. This work was supported by a grant from the National Biomedical Research Foundation. THE CENTER FOR INTEGRATION OF SCIENCE AND INDUSTRY at Bentley University focuses on understanding and accelerating the translation of scientific discoveries to create public value. The Center is an environment for thought leadership and interdisciplinary scholarship spanning basic science, data analytics, business and public policy. For more information, visit http://www.bentley.edu/sciindustry or follow us on Twitter @SciIndustry. BENTLEY UNIVERSITY is one of the nation’s leading business schools, dedicated to preparing a new kind of business leader with the technical skills, global perspective and ethical standards required to make a difference in an ever-changing world. Bentley’s diverse arts and sciences program combined with an advanced business curriculum prepares graduates to make an impact in their chosen fields. The university enrolls approximately 4,000 undergraduate and 1,000 graduate students. For more information, visit http://www.bentley.edu.